Water riding vehicles provide tremendous enjoyment for owners and renters alike. However, jet ski sales reps would bring great benefit to their customers by sharing the proper maintenance guidelines for watercraft units purchased by those seeking the feel of speed on the lakes. Jet ski parts will eventually wear out and cause problems for the owner if these strong, but delicate items are not properly cared for. Jet ski repair shops may charge hefty prices for ongoing engine failures due to ignorance and/or neglect of engine care from jet ski owners. Proper repairs, along with preventive maintenance, such as a winterize procedure for the water vehicle, are a must for the owner to enjoy a long life of his or her water ride. With jet ski repairs being potentially expensive, many watercraft owners will investigate DIY blogs and videos in an attempt to fix any of the jet ski parts found on their lake or ocean jet units. A jet ski owner may think that watercraft repairs cannot be more difficult than the automobile repairs the car owner handles with the assistance of blogs and internet videos. Although jet ski parts have some similarities to automobile parts, there tend to be some complexities with jet ski repairs that the average handyman may be surprised to find when rebuilding that jet ski engine which looked so easy in the beginning. The smaller jet ski engine size can be deceiving when comparing the unit to an automobile engine. Below are 5 potential solutions for jet ski repairs that the novice or experienced owner may need to address in the lifetime of their watercraft. These particular jet ski parts may be overlooked in the initial diagnosis of engine failure. Deteriorated fuel lines can leave debris that may clog up the carburetor which enables a slow, inefficient jet ski engine performance. Some minor homework is in order when replacing fuel lines. Various jet ski models will require a variety of fuel line sizes. 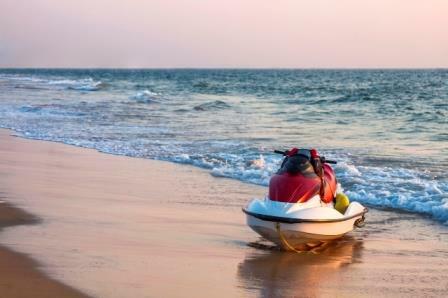 There is no one-size-fits-all for lake or ocean jet ski items. For improved throttle response, fuel line return restrictors can be installed between the carburetor and the fuel tank. Using a fuel stabilizer to help continuously keep your fuel system operating at peak performance can prevent costly repairs to the fuel system in the future. This device is located on the bottom of lake jets. 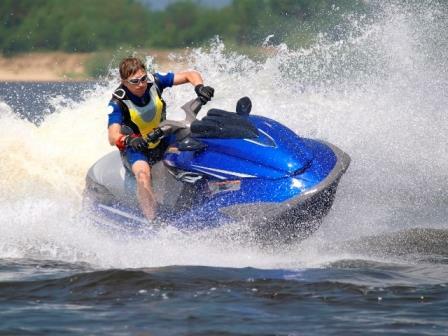 Pumps contain an impeller which is the vital part of accelerating water pressure before it discharges through the rear nozzle of jet ski units. This leads to increased engine control, therefore increasing performance. Some symptoms of a worn jet pump may include vibrating while the watercraft unit is in idle mode. Some owners include the rebuilding of the jet pump every 4 to 5 years as part of their jet ski repair/maintenance procedures. Also included in the pump system are wear rings. The impeller is encased in the wear ring. Constant debris that continues to chip away at these vital parts of the jet pump may have negative effects on engine performance. Maintenance of the jet pump system is one procedure that jet ski owners and even jet ski sales shops recommend as part of a winterize procedure for the vehicle during cold off-season days. Jet ski engine problems may be instigated by rusted crankshafts. Users involved in jet ski rebuilds seem to slightly favor welded based crankshafts. The welds help hold the pins in place. The pins are the key elements that hold the flywheel in place, which is the counterweight of the crankshaft. Some owners believe that crankshafts welded to the cylinders will prevent twisting of the unit. The opinion varies among owners and jet ski repair shop merchants about the superiority of welded crankshafts. The battery is often overlooked as a potential source of problems on many vehicles. Car owners often do not investigate the battery unless the car engine refuses to turn over and start. Engine diagnosis on jet skis often run into the same situations of having the battery overlooked as a potential source of problems. A battery may lose its charge over time if it is left out in the cold over a long period of time. Removing the battery is often recommended as one way to help winterize the watercraft. Batteries should be stored in a garage or other environments that protect it from harsh cold and winds. “Smart” chargers help batteries maintain proper usage levels during the offseason. For extra protection, covering of the battery terminals with rubber or even cardboard will prevent arcing as well as help the unit to maintain its consistency over months of non-use. A battery charger will ensure the unit is ready to go when it’s time to pull the vehicle out of the garage for summertime rides on the water. Seals are vital for engine performance. Seals are another group of items that jet ski owners are not aware of when the purchase was made from the smiling jet ski sales associate. The associate may not mention that worn out seals throughout the engine may allow an overflow of oil in undesired areas. Gaskets are the most common forms of seals for jet skis. Because engine parts are often not perfectly matched, proper gasket materials such as forms of treated paper, or metal will provide the filler for joints that need matching. Metal gaskets, although more expensive, are recommended in many cases as metal is able to withstand outside pressure better than its paper counterpart. Checking for proper seals can be included in the water vehicle’s winterize procedure. Some jet ski parts that require gaskets are crankshaft ends, exhausts, flywheel covers and oil pumps. No matter which parts need connecting, proper seals are a must for the jet ski engine to run to its full potential and lifespan. When a jet ski newbie is looking online for jet ski sales shops, the investigation should be just as intense at looking at the care and maintenance of jet skis. Maintenance is often overlooked by many until the later stages on most motorized items we own. Thoughts of fixing or repairs don’t enter in until funny noises and/or loss of high-end performance begins. If a used jet ski model is an option, a thorough education and investigation of the jet ski parts is a must. The jet ski sales rep should be able to tell the potential buyer about proper care for various jet ski models. If the sales rep is not knowledgeable about technical repairs, he or she should have someone close at hand to give the customer proper repair guidance when requested. One important tip for those who use their jet ski in salt water is to thoroughly clean the jet ski after each and every trip in salt water. This will help to clean out the motor and pumps since salt water is highly corrosive and will damage the motor quicker than just running it in fresh water. The 5 items listed above are not inclusive of all jet ski repairs, but they are pretty common to problems encountered with the vehicles. The five repair solutions, as well as the recommended procedures to winterize, will ensure a longer life of the water units so more time can be spent in the summer riding on the currents and less time and money spent in the garage fixing jet skis. Hi Colby, please contact us at marketing@goldeagle.com and we can help you. I have a 2016 FXSVHO I was writing it this weekend under full power There’s nothing in the impeller. I can only run 42 miles an hour 5600 RPM any suggestions? Hi Wally, It may be difficult to ascertain what the issue could be without being presently there. However, if replacing the fuel with higher octane, fresh fuel, or/and adding a performance additive such as STA-BIL 360 Marine, doesn’t help, perhaps the best option is to have it serviced by a professional mechanic. Hi I have a Kawasaki ts 30yrs old it starts and runs fine out of water but the minute it’s in the water it won’t even start? Hi Simon, since we are not able to assess your car in person we would suggest taking it to a trusted professional mechanic. Hello! If you suspect water is in the fuel tank then we recommend Iso-HEET® Water Remover & Premium Fuel Line Antifreeze + Injector Cleaner. This will help to remove water from the fuel system. If you have any other questions please contact consumer support at producttechsupport@goldeagle.com. I put the battery cables on backwards. Now my ski won’t do anything,,,What can I do to fix the problem?? Hi Kevin, In this particular situation, perhaps it would be helpful seeking a second opinion from a different professional technician. IF you still have questions please contact consumer support at producttechsupport@goldeagle.com. Where can I buy the parts to change my 1997 1100 STX from oil injection to mixed fuel use? i have a 1995 Polaris 750 SLT jetski that will not turn over .does anyone in the metro Detroit area work on Polaris jetski’s? In have a 1997 Yamaha wave runner in great condition. However, when I put it up on the dock for an engine flush, the engine races out of control, forcing me to pull the emergency stop cord be use stop button won’t work. What is going on? Hello! This could be due to having water in the fuel. We would recommend using ISO-HEET to see if that helps. If the issue continues or gets worse, perhaps the next step is to have it serviced. I have a Kawasaki STX 12F that runs great and is garage kept. However, when sitting overnight of long periods of storage, I have to crank it over 15 or 20 seconds to get it to start. seems like the fuel system loses pressure. Is there a check valve in it somewhere?